Celebrate combined Emancipation day for Jamaica, Barbados, Trinidad & Tobago & Guyana! with us as we warm up winter! This is an epic celebration, as Nasty Teks front man 'Mickey Glamour' gets ready to unleash his wicked microphone skills! In addition we have DJ Fasmwa (Soca/Dancehall Specialist) & DJ Ronnie (Nr.1 African DJ) be there to experience it! Remember this is a celebration - So, no standing around and watching. Strictly dancing! 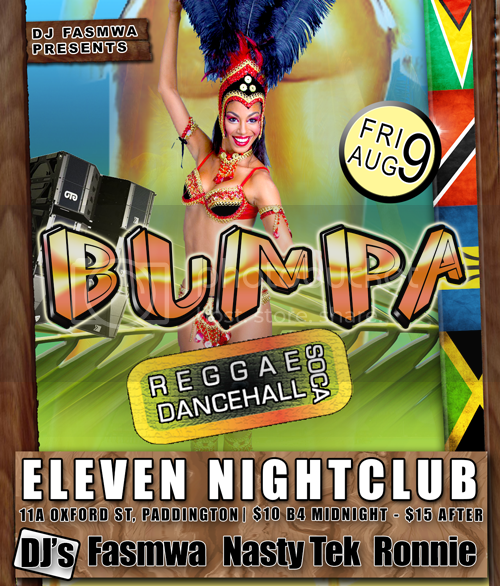 You will be dancing to a classic Nasty Tek selection, Soca & Dancehall! ➜ PLUS: Creole Zouk Sydney's, Nr.1 French Caribbean Party! 10.30pm-late / $15 / 18+ ID req. $6 beer & house spirits 9pm-11pm / $10 Ti'Punch all night! Free entry for 2 & discount guest lists! Email: fasmwa@gmail.com for more info.